Oh oh oh, let’s spred the Italian Christmas tastefulness! It’s Christmas time and here at True Italian we are thinking about true Italian Christmas recipes! What is that Italians have for dessert during those cold December nights? Let’s find out together the most famous traditional Christmas recipes and what Italians eat across the Bel Paese. Which one will you pick? Pandoro has Venetian origins (to be more precise, it is said to be born in Verona) and its name means “golden bread”. Being a white bread product, it was reserved for a long time for nobility and higher classes. It is a tall yeast bread shaped as a eight-points star and you can taste many and different versions, such as stuffed with chocolate or pistachio cream. 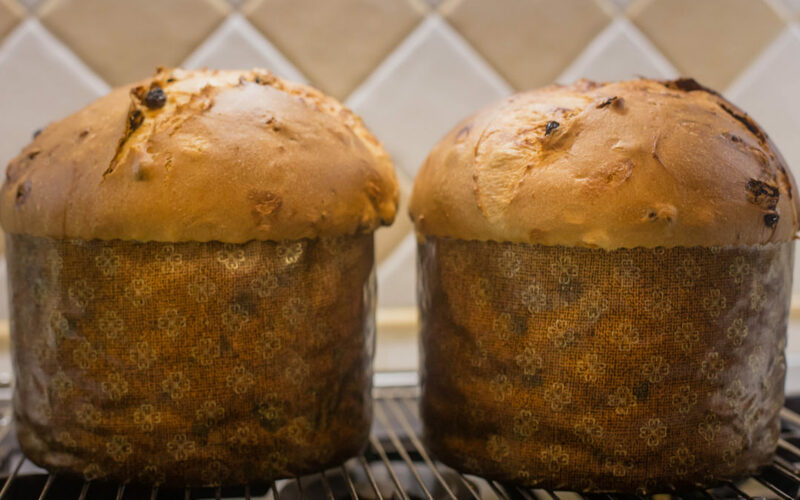 On the other hand, we have Panettone, a sweet bread loaf from Milan. The name (“bread of Toni”) reveals the legend behind this cupola-shaped dessert: during XV century, a distraceted chef named Toni forgot to bake a dessert for a extremely important dinner organised by Ludovico il Moro, Duke of Milan. As soon as he became aware of the fact that he had to bake something urgently, he realised he had only flour, butter, eggs, lime zest, and raisins. Torrone is a worldwide well-known confection typical of countries which have been under the domain of Spanish empire, i.e. Italy, Spain and countries in Latin America. Made with honey, sugar, egg white with toasted nuts (generally almonds), its geographical distribution across the country is quite bizzare, as each region has its own variety of Torrone. For example, torrone from Benevento is said to be the oldest and it has crumbly consistence, while torrone from Cremona is sticky and soft. Fancy some biscuits? Sienese tradition (Toscany) has delivered to us these two types of biscuits, typically prepared for Christmas. Ricciarelli are made using an almond base with sugar, honey and egg white. To bake these cookies almonds are grinded and and the dough is left two rest for two days. Cavallucci are biscuits prepared with anise, almonds, candied fruits and coriander but the very special ingredient is millefiori honey. They deriver their names from the original print on the biscuits themselves, picturing a horse (“cavallucci” could be translated from Italian as “small horses”). Thus Siena is famous for its palio, in which city’s contradas compete in a horse race. Talking about Christmas biscuits, Mustaccioli deserve to be on this list. These chocolate-almond pastries come from Neapolitan tradition and, altough they have a soft consistence on the inside, a layer of chocolate (or white chocolate) covers them on the outside. For those who have a thing for Tuscal flavors, Panforte represents a very tasty way to celebrate Christmas. It is made with honey, sugar, fruits and nuts, all mixed together in a chewy confection. The final resut is a close relative to the also well-known Panpepato. In this spicy and fruity sweet treat you will find not only the tastfulness of the figs, but also the legacy of tradition. These dried figs are stuffed with nuts and spices and then pressed together in a shape of a cross. Indeed their particular shape arises from their being traditional Christmas sweets. Struffoli come from the tradition of Campania. They are made of fried dough shaped like little balls. Their origin is lost in time, but they always conquer everyone’s heart with their sticky cruncy layer on the outside and their warn soft dough inside. From the opposite side of the coutry comes this beautiful dessert. It is a sort of bread with sugar and fruit and its origins are lost in Trentino Alto Adige culinary tradition. What make this sweet so christmasy is the name. The word “Zelten” means “sometimes”. As a matter of fact, this sweet is prepared only in a specific time of the year, i.e. Christmas time.